While not a classic sangria, this is a sangria-like drink made with a Beaujolais wine and cherry brandy that you'll need to start preparing three days in advance. Combine 2 pints of the raspberries with 2 cups of the sugar and the lemon zest and mix thoroughly in a bowl. Cover and refrigerate for 3 days. Stir the vinegar into the raspberry mixture and strain the raspberry shrub through a fine sieve into a 1-quart glass jar. In a small saucepan, bring the water to a boil with the remaining 1 cup of sugar over moderately high heat, stirring to dissolve the sugar. Remove from the heat and add the mint sprigs. Let cool to room temperature. Discard the mint sprigs. 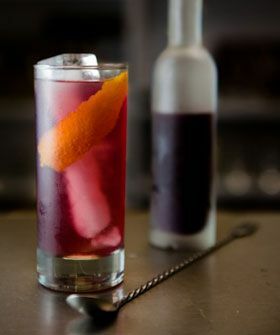 In a large bowl or pitcher, combine the Beaujolais, cherry brandy, lime juice, 1 1/4 cups of the raspberry shrub and 1 1/4 cups of the mint syrup; reserve the rest of the raspberry shrub and mint syrup for another use. Refrigerate the cobbler until well chilled, about 4 hours. Serve the cobbler in collins glasses over ice, garnished with orange wheels and the remaining 1/2 pint of raspberries. *The raspberry shrub and mint syrup can be refrigerated up to 1 week.